A past feature article included a list of criteria for featuring cars here, basically covering various features that come in unexpected quantities (4-seater Miata, anyone?) or dimensions, or things that function differently than you’d expect, like suicide doors. 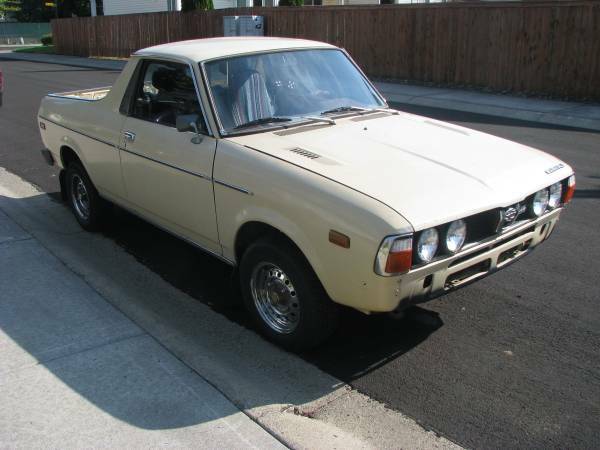 Subaru’s BRAT, designed to circumvent the infamous VW DoKa-killing chicken tax, is another perfect match – a half-car with two seats in the bed that look like someone beat up the local kids, stole their Big Wheels, and bolted the seats into the bed. 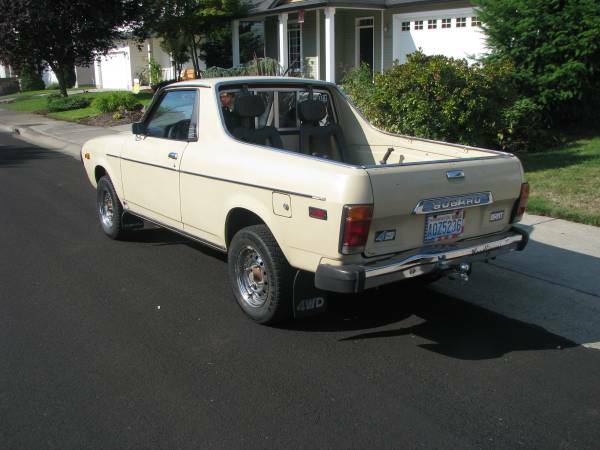 Check out this 1978 Subaru BRAT for sale for $1900 in Vancouver, WA. Most of these are quite beaten up, especially at the lower end of the market, but this one looks straight and rust-free. Seats are wearing covers, so you can only imagine what the upholstery (and the rest of the interior) are like, but hiring someone with a sewing machine is cheaper than hiring a welder. Further on the plus side, the car is said to have a rebuilt engine, new struts, a performance carburetor of unknown origin, and newer tires. It also comes with the original canopy and the critical jump seats. The front end desperately needs something to replace the original bumper – perhaps a bull bar and some big fog lights? Unfortunately, this one does not have the full graphics package, which in combination with the flesh-colored paint job conspires to make the appearance somewhat boring. The chrome wheels seem to be a step back from the much more butch while multispoke steel wheels often seen on 4-wheel-drive Subarus of this vintage, although with the beige paint they’d look better in a darker color. Since the BRAT has a tow hitch, you’ll want to listen carefully for signs of driveline wear, and ask the seller what they towed with it. This would be an awesome way to start your collection of oddball pickups, followed by a Mazda Rotary Pickup and a VW Caddy. Where else can you find a flat-4 powered, four-wheel-drive pickup with fixed seats in the bed? That’s right, nowhere. This entry was posted on September 23, 2014 at 3:19 pm and is filed under Feature. You can follow any responses to this entry through the RSS 2.0 feed. You can leave a response, or trackback from your own site.